How do girls go from just being a girl, to a Car Chick, then to creating the GirlsNGarages website? This article is about a young woman who never originally was a car gal, but did know the basics about cars. When I say basics, I mean more like how to check the oil, change a tire, the wiper blades, and a few other basic items, but that was about it. I think I can say that Karen Vielkind fell into the same category as many women out there who own cars. This all changed when Karen met her now fiancé four years ago in a garage. A close friend of hers was into Rock Crawling, and a friend of his just happened to be a builder and fabricator of Rock Crawlers. So one day, her friend asked her to go with him to check out the progress on his Crawler, which was being worked on at a local garage. Karen, being out of her element, found all this fabricating to be some pretty crazy stuff. She sparked up a conversation with the mechanic and they hit it off right away and Karen started learning a lot more than she ever knew about Jeeps, off road vehicles, and the basics of maintenance. 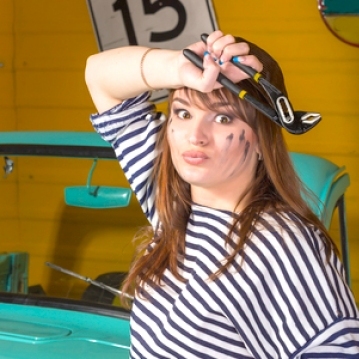 Karen became so fascinated with what she was beginning to learn about automobiles from her fiancé, that she decided it was time to branch out to educating and connecting with other women who love cars, wanted to know more about cars, or just connect about cars. I guess you could say, meeting her fiancé has changed her life’s direction and her newfound passion for everything automotive. So much so that she has began working on publishing a magazine, GirlsNGarages. It is amazing how one day your life is heading in one direction and then the next day it takes a “right turn” into another. This magazine has become more than she could have ever imagined. 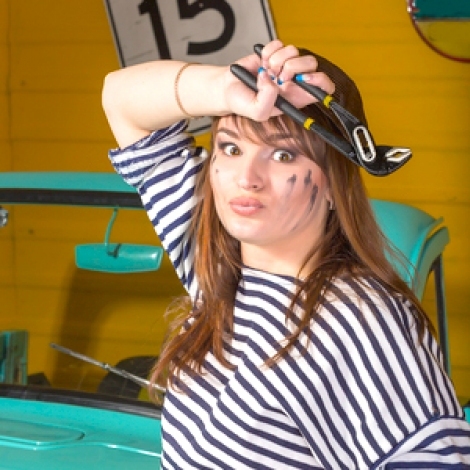 Karen states that if she can help at least one woman learn something new about her car, or persuade one young lady that going into the automotive industry is right for her, then she has realized her dream. The magazine GirlsNGarages just launched its first issue in June of last year. This is just the beginning for Karen; she is so excited to be featuring all the inspiring women in the Automotive Industry in future issues. Success stories such as this one go to show anyone that your life is full of right and left turns, but how you travel down them will define you. It is never too late to change your direction or your desires. Women are becoming more and more embedded in the Automotive Industry and the Racing world than ever before. In the last few NHRA events, three women took the top spots and are making history with every turn on the race track. So if you have a dream, a passion or desire to be something you have dreamed about, reach for the stars and if you grab the clouds, that is a great start. Never settle for anything less in life, Become who you want to be and always stay true to yourself. Karen, in this article, exhibited just how you can really make something out of your life. Now she is reaching out to other women to help educate them when it comes to their cars and in many cases their selfesteem. After featuring Karen on my Radio Show and hearing the passion in her voice, I know this is all just the beginning for her. You go girl! Check her out at www.girlsandgarages.com.